Shankari: Handcrafted Balinese Jewelry Regarded as "Tools of Light"
LOS ANGELES, CA -- (MARKET WIRE) -- December 5, 2005 -- During the holiday season, finding a meaningful and unique gift can be a challenge. Rather than choosing something solely for its aesthetic appeal, it can mean much more when you choose a present with a specific meaning intended specifically for the recipient. Shankari, a Balinese jewelry designer who creates one-of-a-kind and limited edition pieces, offers items that can be given as the epitome of that well-thought-of gift. Her collections are entirely personal and bring the wearer empowerment, light, healing, clarity, balance and strength. "The truth is, my pieces come to me from another dimension and designing them is the easiest thing I do," Shankari said. -- For the yoga enthusiast or anyone who relates to the "Om" symbol, an original gift could be the "Cleansing Pendant V." It is a petite pendant made with a diamond-cut Peridot, three princess-cut Amethysts and four sterling silver Omkaras. This piece cleanses the body and spirit and supports healing with the energies from the Peridot. Repeated as a mantra, "Omkara" is believed to be the most sacred symbol in the universe. It is said that repetition of "Om" enables one to maintain mental and emotional calmness, overcome obstacles and find understanding. Amethyst inspires piety, sincerity and spiritual wisdom, and opens the spiritual and psychic centers. It measures approximately 3/4" in diameter (1.9 x 1.3 cm) and retails for $385.00. -- The "Omkara Ring III" is also perfect for men or women who practice yoga or other spiritual quests. It features the Omkara (Om) symbol on a background of White Shell, which holds the energy of integrity and purity. It measures approximately 3/4" tall by 1/2" wide (1.9 x 1.3 cm) and retails for $195.00. -- The "Healing & Love Pendant XXI" may be perfect for someone in search of a new relationship or recovering from a broken heart. 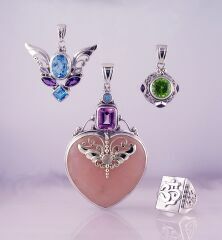 It features a large Rose Quartz heart, emerald cut Pink Topaz, two round Opal triplets and Wings of Freedom symbol. Rose Quartz brings powerful healing energies to remove negativity and bring back a sense of self-worth and self-love. It opens up the heart for both giving and receiving love. Pink Topaz supports the Rose Quartz to manifest the heart's desire, as do the Opal Triplets, which hold the energy to release the wearer from old patterns. Shankari's Wings represent freedom on many levels, but here it is freedom within the heart. The pendant measures approximately 3" tall by 2" wide (7.6 by 5.1 cm) and retails for $680.00. -- The "Manifestation & Balance Pendant XVII" may be just right for someone who is starting a new job, career or marriage. It includes an oval cut and princess cut Blue Topaz, two marquis cut Amethysts, two marquis cut Rainbow Moonstones and Wings of Freedom symbol. The pendant inspires a joyful life by supporting a release from old patterns and helps the wearer to move forward in freedom. Blue Topaz contributes manifestation and balance, granting the ability to grasp control of any situation, while Amethyst inspires humility, sincerity and spiritual wisdom, opening the spiritual and psychic centers. Rainbow Moonstone releases one from old patterns. It measures approximately 1 1/2" tall by 1 3/4" wide (3.8 by 4.4 cm) and retails for $350.00. Shankari's designs can be ordered at www.shankari.com, where you can also read Shankari's empowering messages. Or, call toll free 866-342-2665 for more information. Shankari designs every piece of handmade,<br>one-of-a-kind or limited edition<br>jewelry herself. Shown here, clockwise from top right:<br>Cleansing Pendant V (top right),<br>Omkara Ring III (bottom right),<br>Healing & Love Pendant XXI (center),<br>Manifestation & Balance Pendant XVII (top left).<br>For more information, visit www.shankari.com or<br>call toll free 866-342-2665.